The oldest lucha libre promotion still in existence celebrates 85 years with their anniversary show in Arena Mexico. A hair vs. hair tag team match headlines what is traditionally the grandest CMLL show of the year at the “Cathedral of Lucha Libre” in Mexico City. 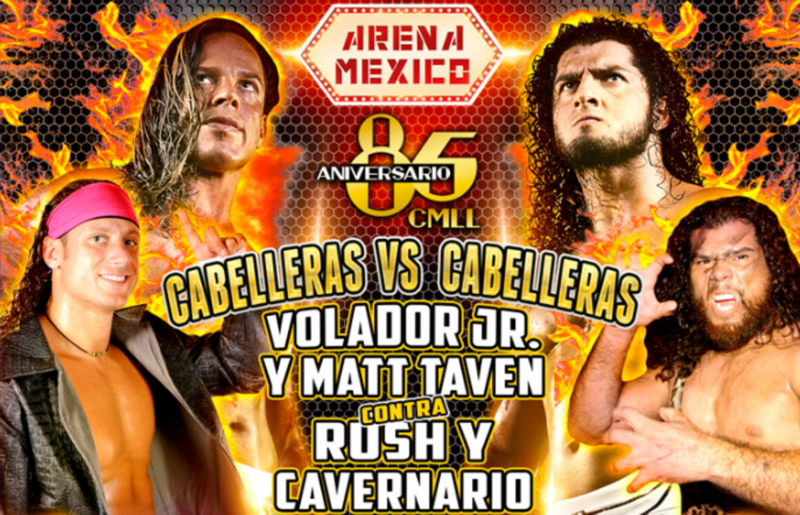 Rush teams with Barbaro Cavernario against Volador Jr. and Matt Taven in a match where each team puts their hair on the line in the main event. The apuesta match is the finale on a six-match card with CMLL regulars and a supporting cast of outsiders. Independent luchador LA Park appears on another major lucha show as teams alongside his son -- Hijo de LA Park -- and Caristico tonight. They face a team comprised of CMLL’s Diamante Azul and the indie darling Lucha Brothers. Penta El Zero M and Fenix (billed as “King Phoenix") continue a trend of them appearing on some of the highest profile shows of the year not run by a public traded company. Los Guerreros Laguneros defend their CMLL Trios Championship against a challenge by outsiders from Klan Kaoz. In the title match, Ultimo Guerrero leads Euforia and Gran Guerrero against Ciber the Main Man (Cibernetico), The Chris (El Zorro) & Scharly Rock Star (Charly Manson). Elsewhere on the card, the legendary Atlantis teams with Mistico and Soberano Jr. to face La Nueva Generacion Dinamita. Also, two more trios matches round out CMLL's 85th anniversary show. The card will stream live on ROH’s HonorClub. Likewise, the show is available as an iPPV for $10 US via internetv.tv. Follow along with our live coverage beginning approximately at 9:30 PM Eastern. The show began with a canned intro that included a video package and new graphics. A women's trios match opened the card. The tecnicas won the first and third falls to take the match. The captains decided the first fall when the tecnicas started off strong. Dalys looked to fire up after reversing a double suplex -- only Sugehit caught her in an octopus hold to submit the ruda captain. The rudas went on to even the score in the second fall. Metallica jumped off the top rope into a senton bomb to eliminate Marcela via pinfall. A moment later, Reyna springboarded into a Vader Bomb to pin Jarochita. A tecnicas made a comeback in the third fall. Marcela off the top with a double foot stomp set up her applying La Tapatia on Reyna for a submission. Meanwhile, Jarochita submitted Metalica with a Muta Lock. In the first fall, an Audaz springboard splash to the outside led into the tecnicos scoring dual submissions. The brothers -- Angel de Oro & Niebla Roja -- submitted Casas & Felino with campana holds. La Peste Negra ("The Black Plague") plotted their revenge during the second fall. Felino eliminated Audaz via pinfall after an avalanche powerbomb off the ropes. Mephisto then suplexed Neibla Roja off the ropes onto his own brother. Mephisto then covered both brothers in pinning Neibla Roja for the rudos to take the second fall. The tecnicos made a comeback that led to a trifecta of dives. Felino was eliminated with a Bubba bomb and a submission hold. Audaz then submitted Mephisto with a cross-armbreaker for a tecnico win. La Nueva Generacion Dinamita cosplayed as bullriders for their entrance. The New Dinamitas later spurred their way to victory. They took an early advantage in the first fall. Forastero eliminated Soberano via submission using an armbar. Sanson held Atlantis in a backbreaker for a springboard elbow drop from Cuatrero similar to the old Demoition finisher. Cuatrero pinned Atlantis for the Dinamtas to win the first fall. The rudo onslaught continued until a tecnico comeback led to a parade of dives. The tecnicos would go on to win the second fall to tie the score. Atlantis got to shine before more wild dives. Soberano executed his tornillo splash on Cuatrero. Forastero springboarded into a dive on Soberano. The captains then squared off. Sanason had Mistico in a Torture Rack that he turned into a sit-out super powerbomb to pin the tecnico captain. The outisders won the CMLL trios titles in an upset with a screwjob foot on the ropes finish. Although Los Guerreros Laguneros are normally rudos, they were the defacto babyfaces in this feud against the outsider faction. Klan Kaoz triple-teamed Ultimo Guerrero to win the first fall. Ciber pinned Ultimo Guerrero for the invaders to gain the lead. A Laguneros rally led to a flurry of offense by the home team. Euforia then submitted The Chris -- while Gran Guerrero also submitted Rockstar with a stretch muffler. The defending champs tied the score at one fall apiece. The Guerreros faction ran wild in the third fall. After a series of highspots, the dust settled and the captains faced off. Ciber tackled Ultimo Guerrero and went for a cover. Ciber cheated to win by putting his foot on the ropes for leverage. The referee counted to three and awared the titles to Klan Kaoz. The crowd seemed somewhat stunned. So was I. Guerreros protested with the ref and officials at ringside -- but to no avail. The decision was final. The titles had changed hands. The invaders raided a championship. LA Park wore a Predator mask and costume during his entrance -- which is fitting with the new movie debuting in theaters. The Lucha Brothers were once kids that revered Arena Mexico, and now their journey brings them back again to the same hallowed building. This time they are on the winning side in a featured match in the venue they so revered. What a storybook moment of dreams turning to reality. In the first fall, the father and son duo scored a pinfall for their trios team. Before that, Penta was sent into the front row by a tope from Caristico. Hijo de LA Park went on to pin Phoenix after a wicked-looking double underhook driver. LA Park speared Azul for the other pinfall. A wild brawl erupted in the second fall. They fought around ringside and up the aisles. Park was whipping people with his belt. The Lucha Brother launched into a double team comeback. They screwed up one spot, and the crowd let them know about it. They still popped when they were successful on a second try. Fenix gave his brother -- Penta -- a super Frankensteiner off the top to the floor on awaiting bodies. In the ring, Azul submitted the opposing captain when he applied a camel clutch on Park. The third fall saw all kinds of highspots. Father and son got nearfalls. LA Park did a tope suicida -- which is crazy for his age and size. Hijo de LA Park did a flying crossbody into the front row on Phoenix. A false finish led into the actual finish. A parade of dives gave way to a Lucha Brothers tandem attack. Phoenix jumped off the top rope with a double foot stomp to spike Carstico into a package piledriver from Penta. As Penta pinned Caristico, Pheonix delivered a Fenix Driver on Hijo de Park for the deciding pinfall. Rush & Cavernario had by far the coolest entrance of the night with dancers and elaborate costumes. They went on to win the first and third falls to take the hair of Volador & Taven. Rush & Cavernario were seemingly the crowd favorites on this night to a vocal majority of those in attendance. Volador got booed by proxy because he was teaming with Taven. The crowd seemed to loath any thoughts of Taven possibly winning. Volador was somewhat protected despite losing. Taven cost Volador the match, and then turned on him in an angle afterwards. The long mane of the caveman remains intact. Likewise, arguably the most coveted hair in lucha libre also remains alive with Rush. The first two falls went quickier than the lenghtly third fall -- which was filled with dives, highspots, and false finishes. During the actual finish, Taven caught his own partner -- Volador -- with a kick to set up the deciding pinfall. Taven then turned on Volador after the match. Both still left with their head shaved. The first fall began with a brawl in typical Rush fashion. Cavernario went on to pin Taven. Rush hit a basement dropkick on Volador to pin him. Rush & Cavernario continued their dominance into the second fall. They taunted with a tranquilo pose and push-ups. Taven & Volador fired up. Volador springboarded into a super Frankensteiner on Cavernario. Taven then jumped off the top rope with a frog splash to pin Cavernario. Volador superkicked Rush -- setting him up for a backstabber from Taven to score a pin. That evened the falls. The third fall was a highlight reel of action. The trading of near falls began with Rush giving Taven an exploder suplex into a corner. Taven countered moments later with a bulldog DDT. Cavernario joined in the exchange of near falls after giving Volador a crucifix buckle bomb. Cavernario followed that with a fisherman's suplex for a two count on Volador. Volador reversed another crucifix attempt to cradle Cavernario. Rush made the save with a shotgun dropkick to break up the count. The trading of near falls continued. Rush and Cavernario cleared the ring. Rush then flew into a tope con hilo on Volador. Cavernario followed with tope through the turnbuckles on Taven. The momentum would soon shift when Taven and Volador made a comeback. Taven moonsaulted off the top to the floor -- and Volador did an Asai moonsault. A frog splash by Taven led into a double near fall. Cavernario & Rush soon cut off their opponents as much of the crowd cheered. Cavernario did his crazy splash off the top to the floor on Taven. Volador and Rush squared off -- but Rush powdered. The crowd showered Rush with boos for practically the first time during the match. The audience would soon pop for a flying crossbody from Volador as he dived off the top into the front row. The madness kept going as Taven did a flip dive over the ropes to the outside. Going into the finishing sequences, Cavernario submitted Taven with La Cavernaria. Volador got his feet up to block a Cavernario splash. He then executed a Canadian Destroyer on Cavernario for a pinfall. That set up sudden death where a pinfall on either Rush or Volador would decide the match. Taven went for a disaster kick -- only to hit his own tag partner instead. That left Volador defenseless as Rush hooked him and delivered a Jay Driller for the final pinfall. Taven turned on Volador immediately after the conclusion of the post-match pyro. Confetti fell around them while Taven soon realized he too would be losing his hair alongside Volador. Taven tried to flee, but Volador dragged him back into the ring for the head shaving. After Taven had his head shaved, Volador too let the barber cut his locks and shave his head. While the card lost a lot of anticipation in the buildup, the show itself delivered on action. The atmoshpere was that of a supercard, but not the biggest show of the year. The tone and vibe was never on par with some previous CMLL anniversary shows. The drama was never high enough to deliver that emotional crescendo seen in classic apuesta matches. Nevertheless, this as an easily enjoyable card with some great matches.